Teams began with reflecting on their personal experiences and then launching into internet research to narrow this broad challenge. Community members with varying perspectives participated and shared their voting experiences with the teams, both through one-on-one conversations and an expert panel with members from the Chicago Board of Election Commissioners, the Cook County Bureau of Technology, the Cook County Clerk’s Office, Chicago Votes, and the NU Center for Civic Engagement. Manav Parikh (University of Maryland), Austin Feydt (Case Western), and Tanner Shioshita (University of Colorado Boulder) interview Robert Moses about his work with Chicago Votes. 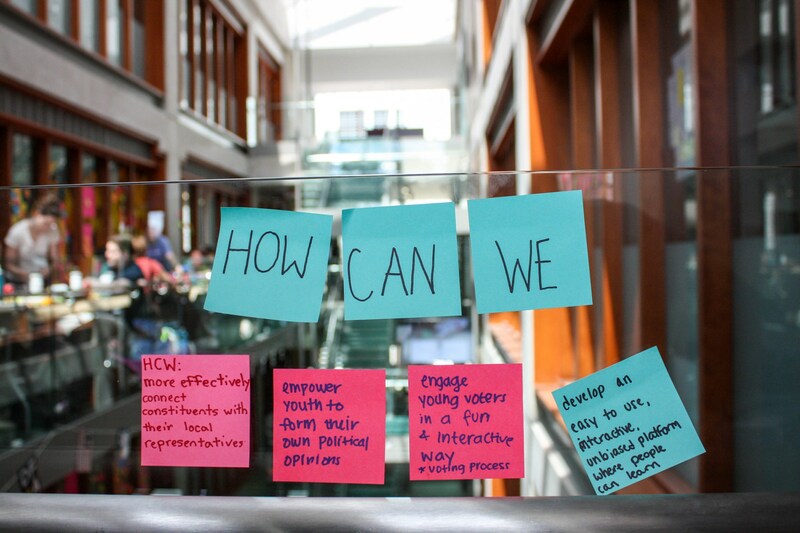 Next, the teams used what they learned from research and interviews to focus on a more specific challenge within the complex issue of voting and civic engagement. 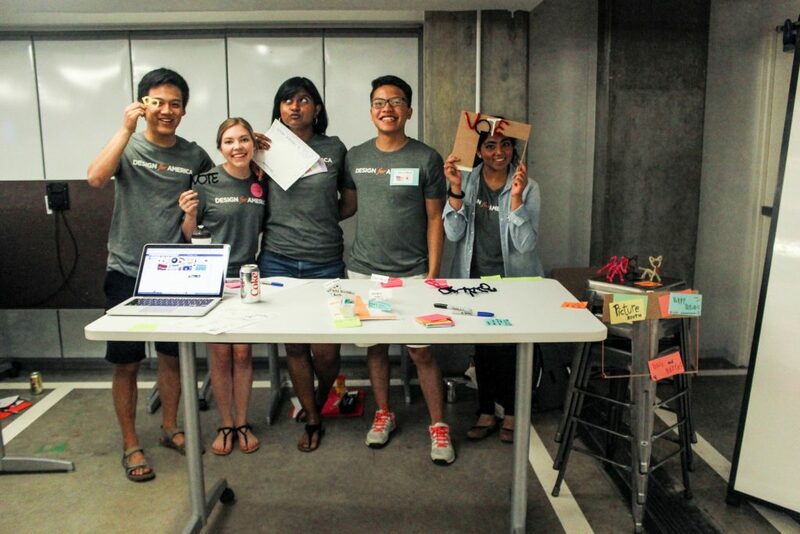 Teams tackled problem spaces that ranged from improving civic education for children, to creating political engagement in everyday lives, to promoting awareness of local and state elections. 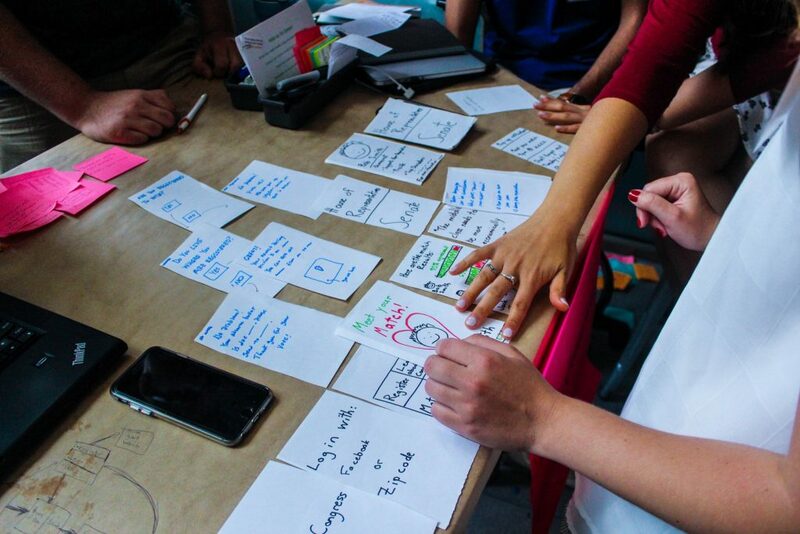 After narrowing their project’s scope, the teams brainstormed thousands of ideas and prototyped and tested a multitude of varying designs. 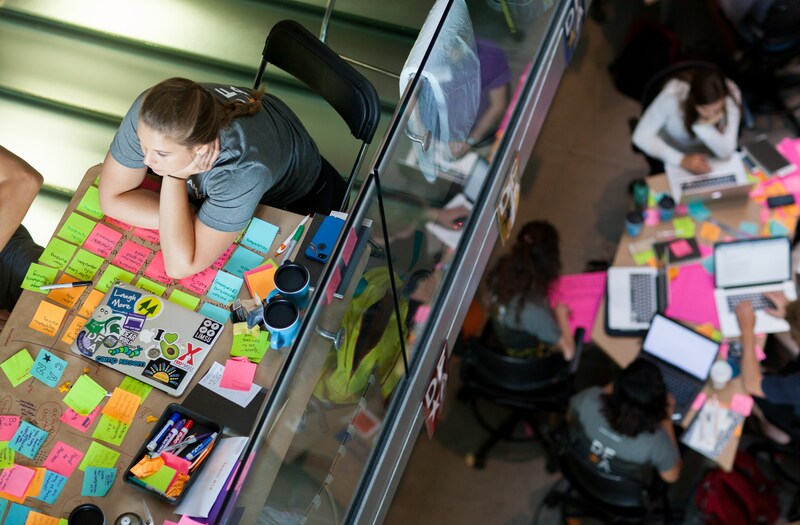 A few of the many problem areas students considered during the design sprint. 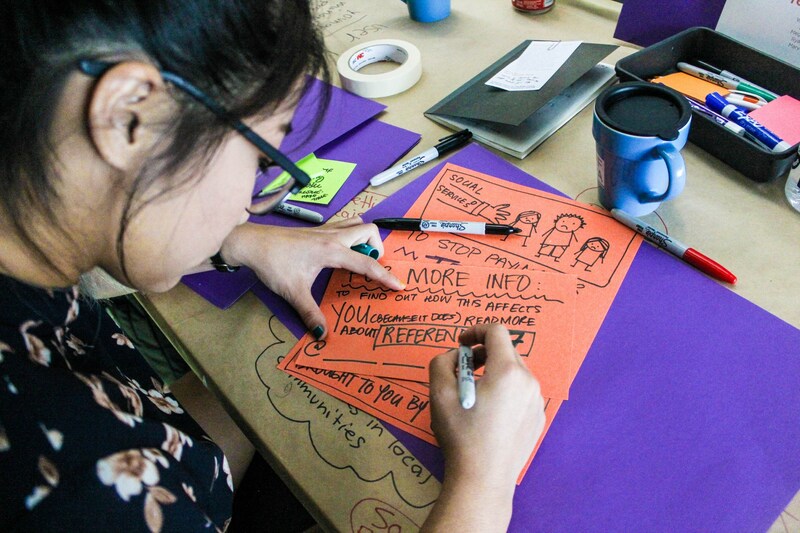 Mary Zhang (Duke) makes a prototype to inform people about local politics. Saturday ended with reflection and discussions about “Testing for Impact” to highlight the importance of testing ideas and getting feedback early and often. Volunteers testing out a prototype of Match.Congress, an app to connect people with politicians whose stances match their interests. 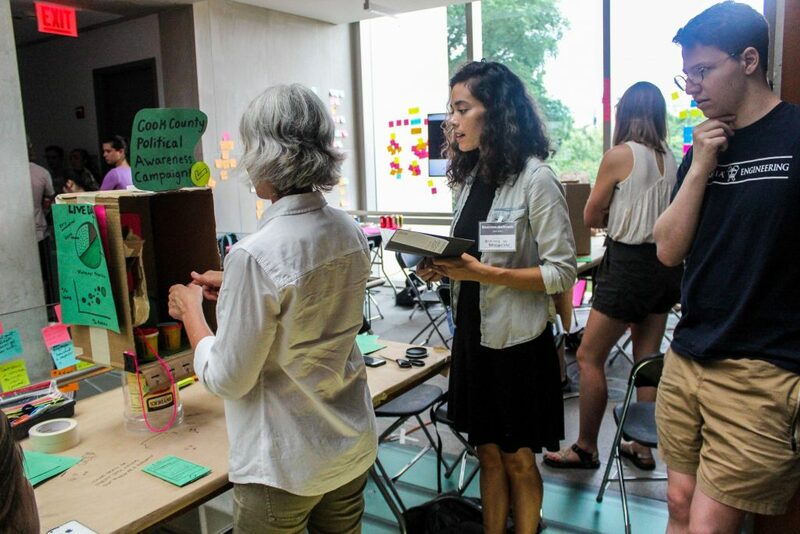 A community volunteer, Betsy Kumor, gives feedback to Noah Gallant (Barnard/Columbia) and Shannon Holloway (NYU) about their concept. On Sunday, the teams made improvements to previous designs or came up with entirely new ones based on volunteer feedback. 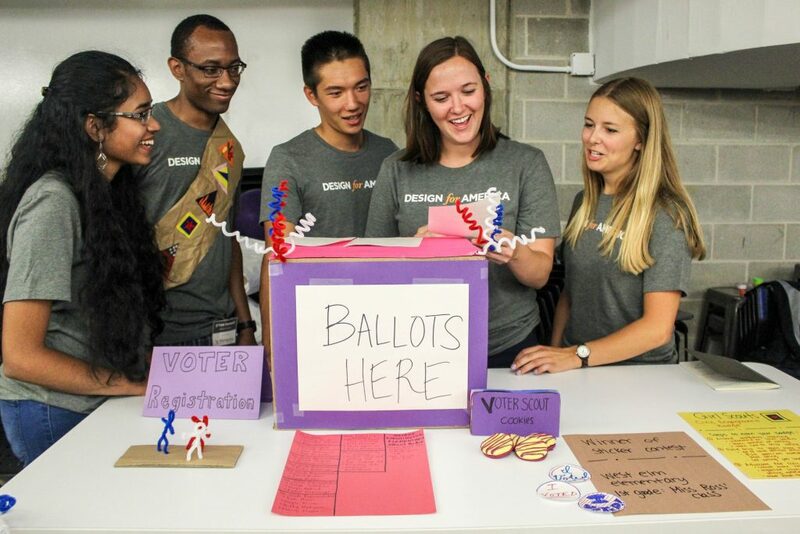 They then had the chance to present their designs to a group of local voters, designers and community members at the DFA Leadership Studio Design Expo in The Garage, Northwestern’s entrepreneurship hub. Infostop is a campaign that works to increase civic engagement at the local level by giving people information about their local government at places they use everyday: such as a bus stop. 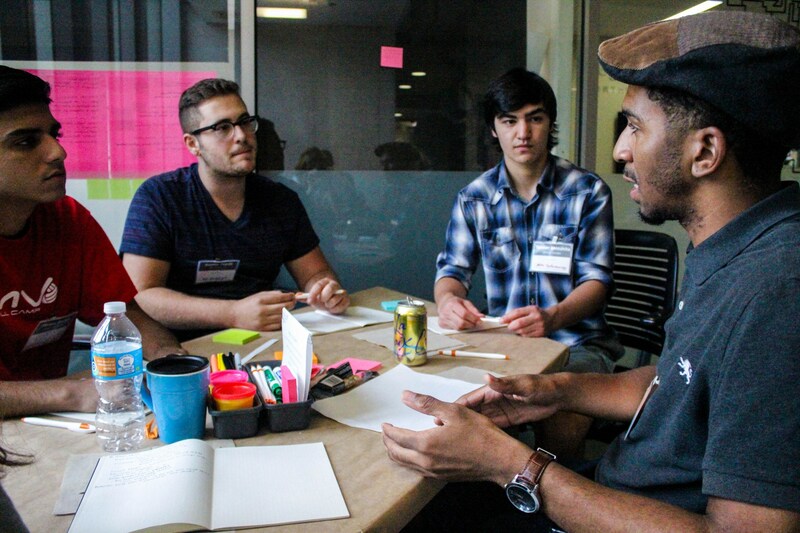 Voter Scouts is a youth civic engagement initiative. Voter Scouts empowers youth through collaborating with Girl Scout Ambassadors and creating a civic engagement badge. The badge is achieved by scouts who participate in advocacy training and petitioning at their schools. For those who read online news, Involvd is a web browser plug-in that bridges the gap between important community issues and steps one can can take to make a positive impact. When a user is reading the news, a small icon on their screen will light up and provide information such as upcoming elections or politicians that have influence over that topic so the reader can learn more and take action. Your Vote Matters creates a pop-up festival experience for young voters to better engage with issues and participate in the voting process. 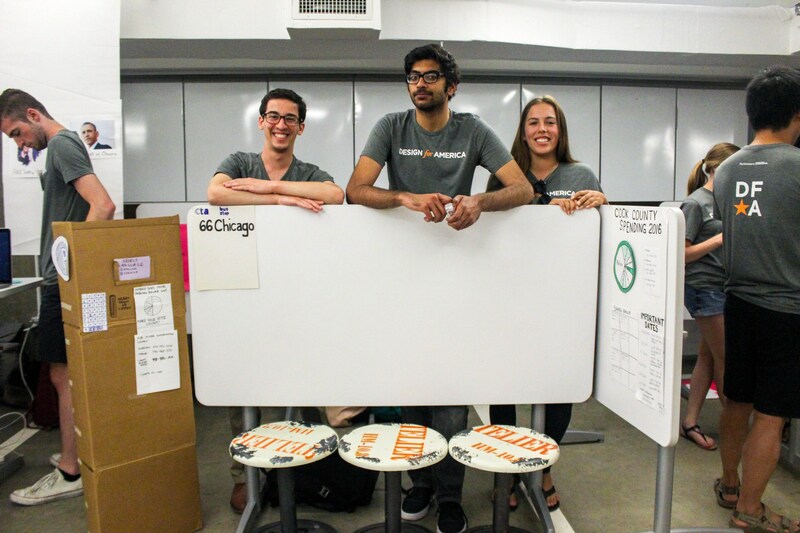 The team designed an impact wall for people in the community to write about issues that mattered to them and create an open forum visible to their candidates. One goal is to have candidates reconsider their position based on the voters’ opinions. Thank you to our community partners and many wonderful volunteers who provided valuable input and helped make this project possible! 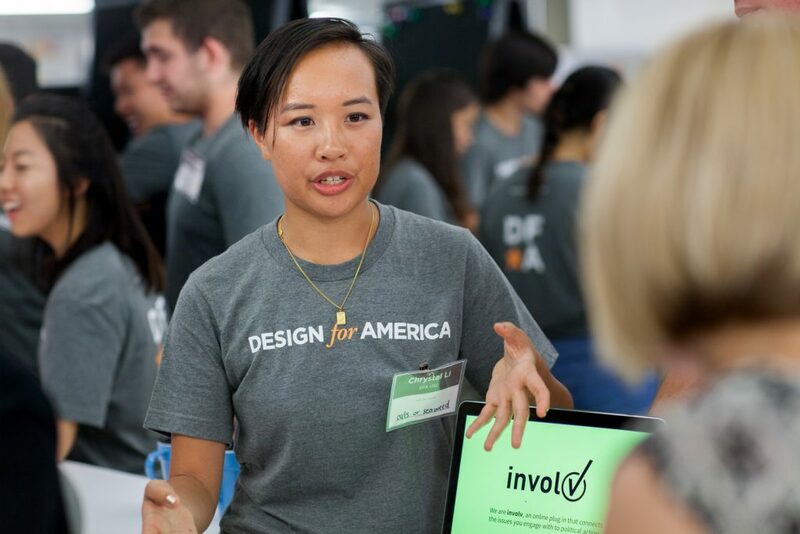 Please reach out to the DFA National Team at info@designforamerica.com if you would like to continue this effort and bring these ideas to life. Previous Post If you have food to share, remember to FREEdge!